Using a hands-on approach, Computer Accounting with QuickBooks® 2015 integrates understanding accounting with mastery of QuickBooks software. The text provides proven instructional techniques based throughout the new edition to make students mastery of QuickBooks as effortless as possible. The Sixteenth Edition offers a complete package to learn the leading small business accounting software: QuickBooks software, comprehensive text, Student Blog, and LIVE Projects. 1. Chapter Tutorials. 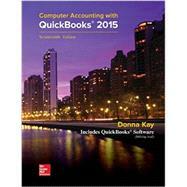 Providing numerous screen shots and detailed instructions, chapters in Computer Accounting with QuickBooks are designed as tutorials for the student to initially learn the accounting software features. All chapters are based on realistic, virtual company cases to enhance your understanding of the business environment in which QuickBooks is used. YouTube videos @ www.myquickbooks.me reinforce chapter tutorials. 2. Learning Activities. To improve long-term retention of student software skills and mastery of QuickBooks, learning activities are included at the end of the chapters. Designed with fewer instructions to test the understanding and, when needed, to develop skills at quickly seeking out additional information to complete tasks, the activities consist of exercises, projects and web quests. JIT Learning, the ability to seek out information as needed, is an increasingly important skill in a rapidly changing business environment. Computer Accounting with QuickBooks is designed to seamlessly facilitate your development of this crucial skill. In addition, the virtual cases challenge you to apply and develop both software and problem-solving skills. 3. Reflection. Reflection improves learning and retention. A reflection exercise, A Wish and A Star, appears at the end of each chapter to highlight what the student has learned. New with QuickBooks 2015, we are pleased to include a Quick Guide in Section 3 to streamline your review for the QuickBooks User Certification examination.